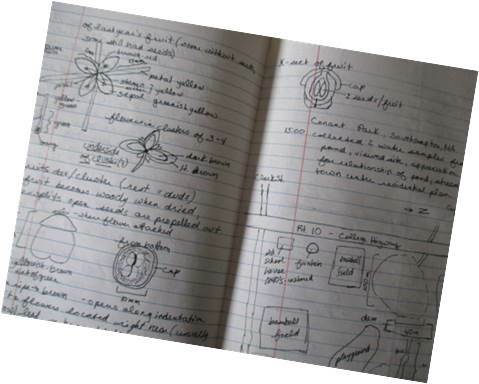 I began my first nature notebook in 1989, while taking an ecology class in college. 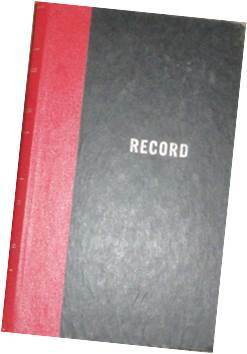 Initially, I used it to record observations I made during field trips we took as part of the class. I still have that notebook, and I sometimes refer back to it for information as well as inspiration. My professor recommended that we purchase a specific brand of notebook and waterproof pen. He told us to keep the notebook in a plastic bag, so it wouldn’t get wet, and suggested that we keep a small ruler in an envelope secured to the inside front cover. 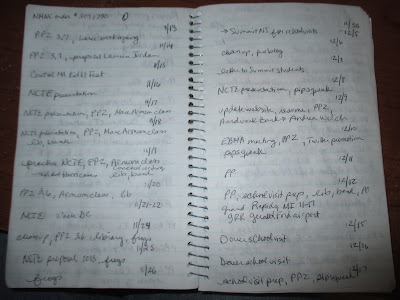 Of course, I followed all his recommendations, but over time, I’ve developed my own persnickety notebook habits. 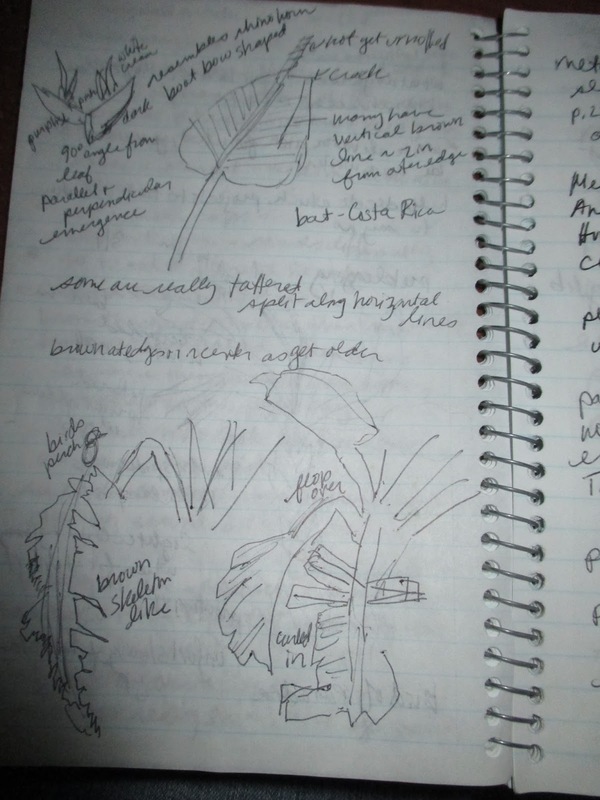 For many years, I only pulled out my notebooks when I went hiking or explored natural areas near my home. 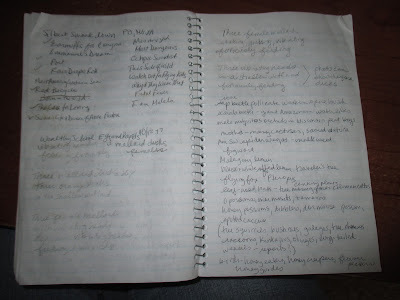 But in 1996, I began a special notebook, a travel log, when I went on safari in Africa. 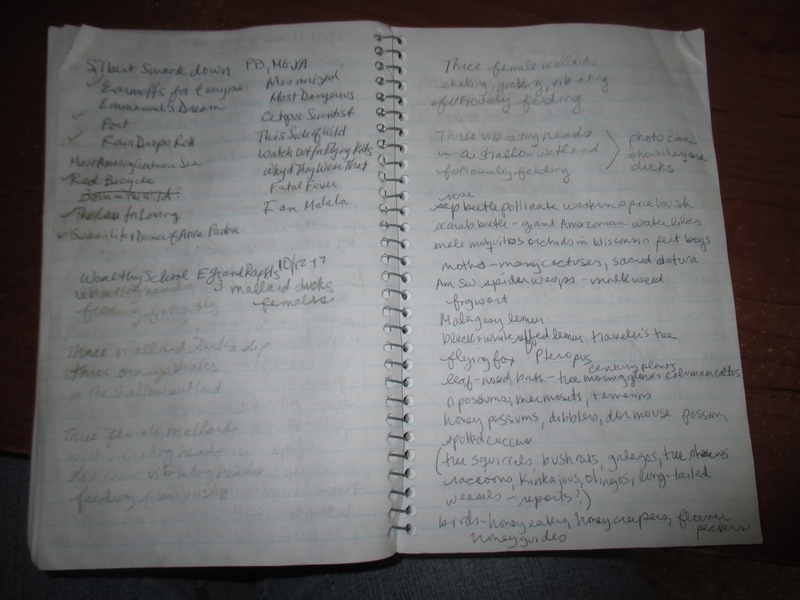 After that, I kept a special notebook for each major trip I took—the Galapagos Islands, the Costa Rican rainforest, the coral reefs off the coast of Mexico’s Yucatan Peninsula, Hawaii, the Florida Everglades. 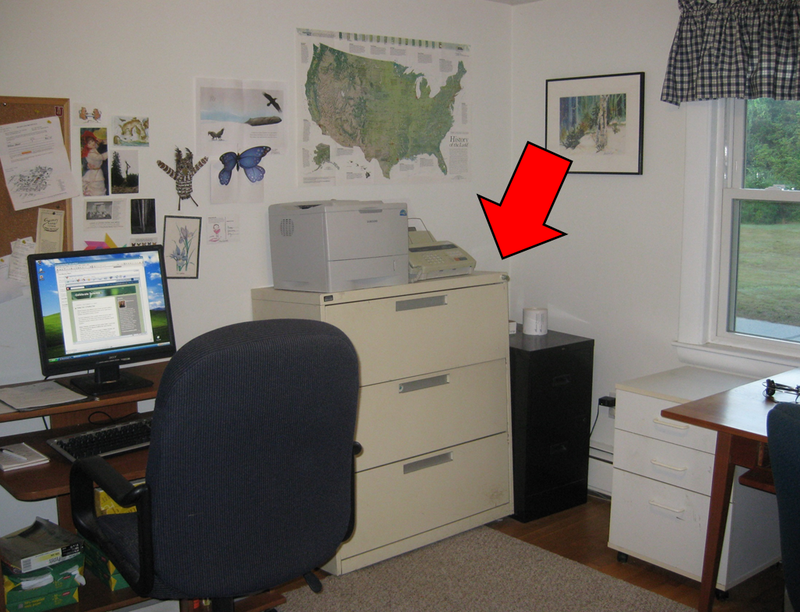 Those travel logs now reside in special folders inside a giant file cabinet in my office, and I pull material from one or more of them for almost every book I write. When I became a fulltime freelance writer in 2000, an account advised me to keep records of how I spent my days to use as evidence if I was ever audited by the IRS. At first, each entry was just a brief listing of projects I worked on each day. But soon they evolved into much more. Today they are a hodgepodge of everything from lists of books I want to read to research notes to snippets of poetry. They include sketches and observations, lists of title ideas, and thoughts about how to structure manuscripts in progress. My notebooks might seem like a cluttered mess to someone else, but not to me. By keeping all kinds of thoughts and ideas together in one place, I always seem to be able to go back and find what I need when I need it. I never go anywhere without my notebook, and I can’t imagine my life without it. It’s my most critical writing tool. One thing I like to do in my notebook when I’m out exploring is make quick lists of observations. I write down anything that makes an impression on me, and then I try to use the observations to write a haiku. During a recent week-long residency at Wealthy School in East Grand Rapids, MI, I accompanied a group of students in grades 3-5 to a local wetland. I was intrigued by three female mallard ducks furiously feeding, probably because they wanted to fatten up before migrating. One student said, “It looks like their heads are vibrating.” What a great comment! That was all the inspiration I needed to start writing. I wasn’t totally satisfied with that, so I left some blank space in my notebook. I thought I might give it another try later. Sure enough, while I was eating dinner, I had an idea. I realized that if I showed a photo I had taken of the ducks along with the haiku, I could use my words more wisely. Thanks to the photo, I didn’t need the first line of the haiku at all. 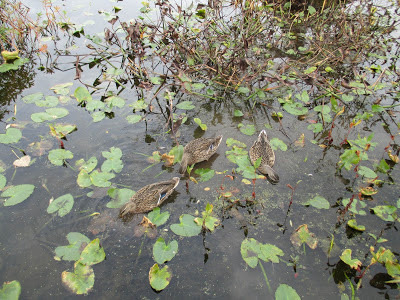 Readers could see the three mallard ducks I was writing about. That allowed me to include some information about the setting. 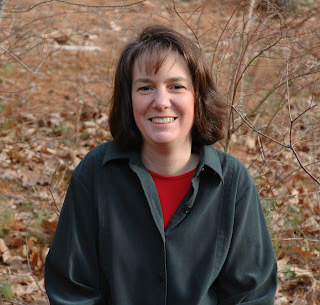 Melissa Stewart is the author of more than 150 science books for children, including FEATHERS: NOT JUST FOR FLYING (Charlesbridge, 2014, illustrated by Sarah S. Brannen), an ALA Notable and winner of the Cybils Award for Nonfiction and the Nerdy Book Club Award for Nonfiction. 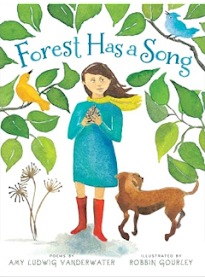 She is the co-author (with Nancy Chelsey) of PERFECT PAIRS: USING FICTION AND NONFICTION PICTURE BOOKS TO TEACH LIFE SCIENCE, K-2 (Stenhouse, 2014). 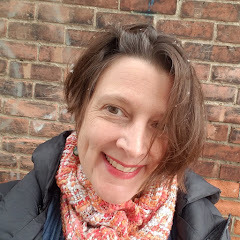 To learn more about Melissa and her work, please visit her website. I am very grateful to National Geographic, one of Melissa's publishers, for offering a giveaway of these three wonderful nonfiction books - SNAKES, DEADLIEST ANIMALS, and METEORS - to one lucky commenting winner! Please leave your comment by Sunday, January 31 to be entered into the drawing. As winners have sometimes not claimed their books, I would like to remind you that I will announce this month's winner in this space on January 31, and I will also make announcements at my Twitter page and at The Poem Farm Facebook page. Please consider following either of those pages if you would like to receive such updates. Please know that Sharing Our Notebooks welcomes all kinds of notebook keepers - of any age and interest - to open up their pages and share process. If you are interested in writing in this space, please contact me, Amy, directly. Hello Melissa! It was great to read your post and browse through your notebooks. Keeping a regular notebook is something that I would like to do more in 2016 and you've inspired me to do more! Thanks for that. I think your second, revised edition of your haiku is my favorite; it stirs the imagination more, and I like the accompanying photo! Thanks for sharing Melissa. 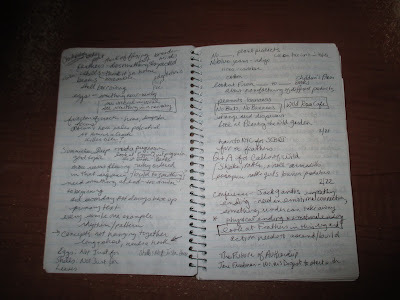 Amy, thanks for this great blog, I hope to read more notebook posts throughout the whole year! You could start out by carrying a small notebook in you bag. Then you can write down things that occur to you when you're out and about. That's terrific. Thanks so much. I am mesmerized by you Melissa. I love what you write. I follow you on Twitter. You have such insight and I model my writing life after you. Thank you for being such an inspiration and for sharing your notebook here. Thanks for your kind words, Kimberley. Melissa, thanks for sharing! I love your professor's recommendations about waterproof pen & ruler to go into a plastic bag--always ready! I also love your idea (and great example) of writing a haiku based on what you see. What a wonderful way to hanging onto the poetry you feel in the moment. That is something I will try. Yes, do give it a try. 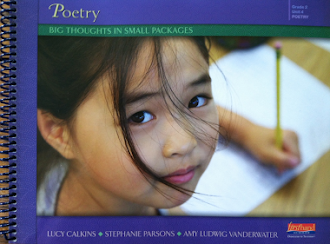 I recommend plunging in during April--poetry month. Try writing a haiku every day. Sure, feel free to share this activity. Good luck with your magazine. Melissa, great revision on the haiku. Congratulations on publishing a grand number of books. Thanks for sharing a combination science/writing moment with us. I'm glad to hear that you've enjoyed my books. That warms my heart. I am always intrigued with other people's writing lives and inspiration. Thank you for letting us examine your process and peek into your your private musings. Although I've always been a notebook keeper, it hasn't really occurred to me to consider nonfiction writing ~ until this past summer. While on a vacation, I was struck by an odd little bit of local history that I had learned about while on a museum tour. I immediately jotted some notes and have hung onto the thought of further researching the topic. And of course, writing about it. :). Make 2016 the year to work on that book idea. It sounds intriguing. Oh, and Amy, have you ever considered hosting a weekly notebook writing challenge??? What fun it would be! I've kept notebooks for a long time, for myself, and I spent lots of time keeping notebooks with my students, with whom I traveled to many places. I love hearing how your notebooks have evolved, the ways you make the smallest things important to capture/remember. Love your books; they never fail to make me smile and teach me something. I definitely prefer the second haiku, Melissa! Thank you for sharing your notebooks and your writing process with us. I always feel better when authors show the "cluttered mess" that writing is. It's so reassuring! It can be messy, Catherine. I think of writing as similar to trying to put together a jigsaw puzzle. I have been lucky enough to meet you at a few edcamps and hear you talk about how you do research so it was fun to now see your notebooks. Observation is great research tool. It was great to see you on Saturday and talk about the challenges of teaching research at nErD Camp NNE. Yes, personal experiences and observations can be great for adding vivid details to writing. Melissa, I loved this blog entry! I, too, have evolved in my notebooks over the years. A week or two ago, I went back to last year's notebook and sticky-noted and titled any entries I thought I might want to revisit again. I found snippets of novel ideas, character entries (Yes! I sometimes let my characters talk in my notebook!) Many nature poems, a little bit of angst, a lot of gratitude and lots and lots of doodles, which I love to see too! This year I started working for TC, going out on the road to intro the Units of Study in writing. And there, I share my notebook with teachers. And I tell them...teaching is important, but a life well-lived inside a well-loved, dog-eared notebook, now that is the best kind of life there is! So glad I stumbled upon your words! Ooh la la! I love the idea of sticky-noting favorite entries in past notebooks. I'm going to try that. What inspiration! Love your notebooks...and what comes from them. Melissa, you are such a great teacher because you are specific, focused and detailed. You already know I love your books, but I also love how helpful your blog is. It is a gold mine for teachers and students. You're too kind, Erika. I'm so glad you like my blog and website as well as the books I've written. Love this idea & your work, Melissa!! I have scribblings for different projects & research snippits in dome of my notebooks, but I really love the idea of having a separate one for each project. I'll try that out--thank you! Melissa, my students and I already love your books. We use Deadliest Animals as a mentor text for information writing. I love sharing your revision timeline from your website with them- we are always stunned at how different the finished book is from your original idea. Now, I can't wait to share this post with them. I'm trying to help them see that notebook keeping is a "life" thing, not just a "school" thing. Amy, thanks for hosting Melissa, and for the giveaway. Allison, I'm so glad that the resources on my website are useful for you and your students. Maria, There are no rules when it comes to notebooks. Try anything that you think might help inspire you and/or keep you organized. 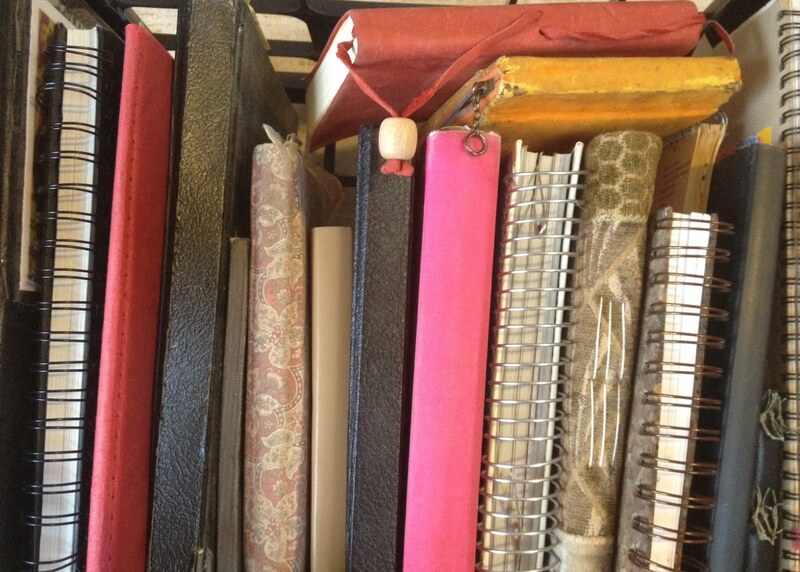 Thanks for sharing your notebooks! It is so neat to get a glimpse inside the mind of a writer. I am currently waiting for a copy of Feathers from my local library. I can't wait to read it! I'm glad you like peeking into my notebooks, Beth. I hope you and your students love FEATHERS. Lasted year I started Bullet Journaling which looks a lot like your current style of notebook, Melissa. Everything in one place. 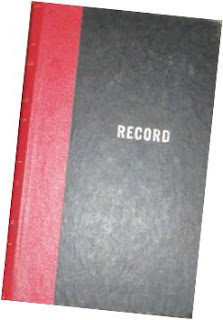 (Though do keep specific notebooks for certain projects that will require lots of research. I take notes, jot ms ideas, etc all in one place). If I understand bullet journaling correctly (as a process that involves recording goals and keeping track of progress on projects), then what I do is different. I have a separate calendar and I do set goals on a separate piece of paper that I keep on my idea board (which is also separate). My notebook is just a place to record what I'm doing and things I want to take note of in the world around me and what I'm reading, hearing, etc. I think bullet journaling would be too demanding and would really stress me out. But I know people who love it and say it makes them more productive. I think it would make me feel anxious and guilty.